This is a beautiful batwa / potli. The design is so full of colourful embroidery and looks rich and elegant. The shape and size is practical and adequate to accommodate essentials and more. The bag comes with a gold beads handle which adds to the style quotient. Color: Red, Pink, Blue etc. 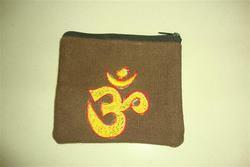 We are the leading supplier of beaded potli bag. 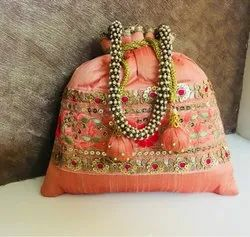 Wedding Gift Potali Bag, Bag Size: 4" X 9"
Bag Size: 4" x 9"
With extensive know-how in this domain, we are indulged in providing a supreme quality gamut of Embroidered Ladies Potli Bag.